A common thing with most laptops that come pre installed with windows is they have their product keys printed on their back. For software and games purchase in physical retail boxes, the product keys are usually stored inside the box. Once you use the product keys it is then important to securely hide them from others so that they cant be stolen. Naturally most of us try to take extra precautions while hiding the product keys and sometimes these extra precautions are the reasons why we forget or lose our product keys. While it is common with most laptop manufacturers, but in some cases such as laptops provided by universities the product keys for windows might not be printed on the laptop’s back. This goes same for all the programs that are installed on it. Generally this wont be a problem, but if you are planning to re install windows, definitely you are going to need a product key to activate your new windows installation. This is where you might be in problem if you don’t have find the product key of your windows installation. Well you don’t need to worry because there a program that can find the product keys for most programs and games installed on your computer. 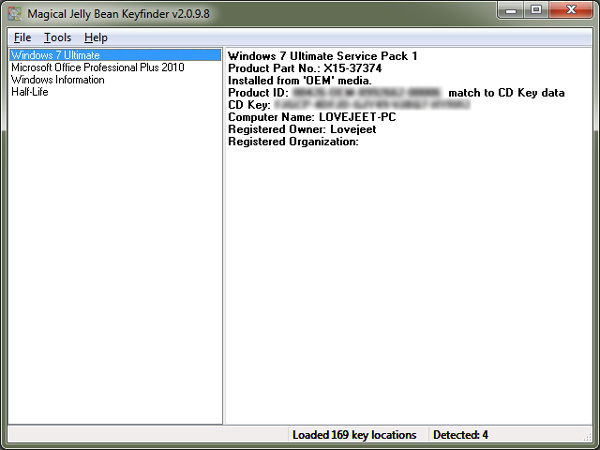 Using the Magical Jellybean Keyfinder , you can easily find the product keys for your windows installation and even many other programs and games which are installed on your computer. While this might not be something that you might use daily, but in case if you ever forget or lose your product keys . Magical Jellybean Keyfinder is just what you will need to recover them. 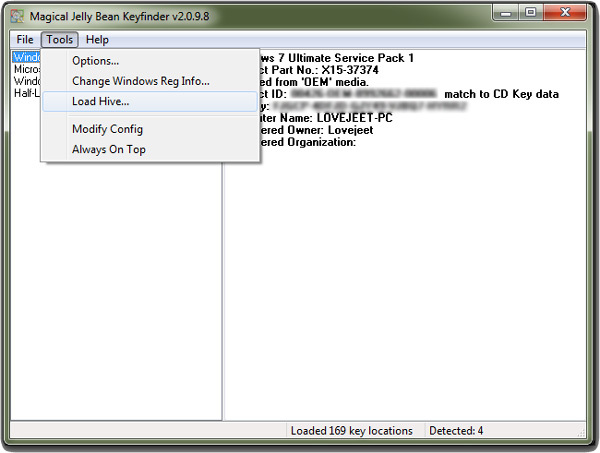 The Magical Jellybean Keyfinder tool is available as a free download for both the windows and Mac operating systems. Here is how you can use the Magical Jellybean Keyfinder to find product keys for the programs and games that are installed on your Windows and Mac computers. Step 1: Download and install the Magical Jellybean Keyfinder tool on your computer. Make Sure you un check any unwanted programs during the installation process. Step 2: Once installed, run the Magical Jellybean Keyfinder program from your desktop. The tool will automatically search for product keys in the registry of your computer and display it to you. Step 3: By default the tool searches for product keys on your computer but you can even search for product keys from another hard drive. Just connect the hard disk with your PC and click on Load hive from the Tools menu. Next you can select the drive where windows is installed and the tool will find out product keys for any installed program.